Libraries are a collection of code that has already been written. We use them when we want to add functionality without have to write everything from scratch. Some the projects in this set need libraries so this section will show you how to install those. Our libraries come in the form of zip files that need to be downloaded but NOT unzipped. WiFi ESP - Commands for the ESP WiFi Module. Chainable LED - Needed to light up the RGB leds. Linked Lists - Used to organize data in some advanced code. 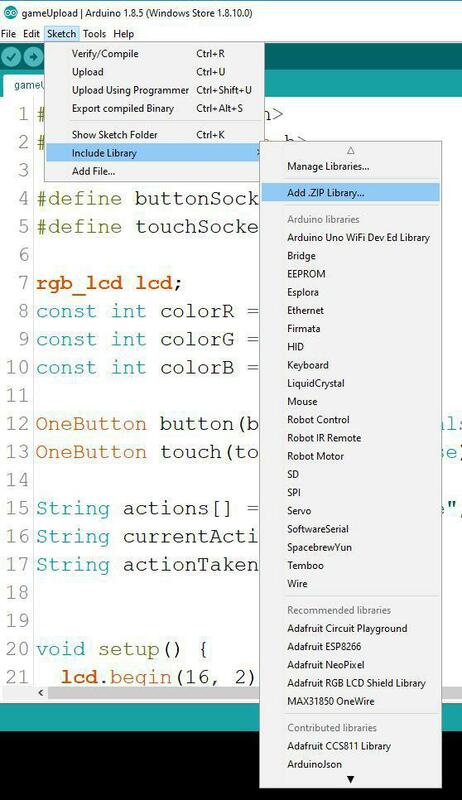 Open up the Arduino IDE and go to Sketch > Include Library > Add .ZIP Library.... After that navigate to the zip files and add them one by one. And that's it!